This afternoon I received a call from a reporter at the Washington Post. I was asked to give my expert opinion on our President’s handwriting as it appeared in the NCAA tournament Bracket. And I had about an hour to do it. ………”the rest of the “story. 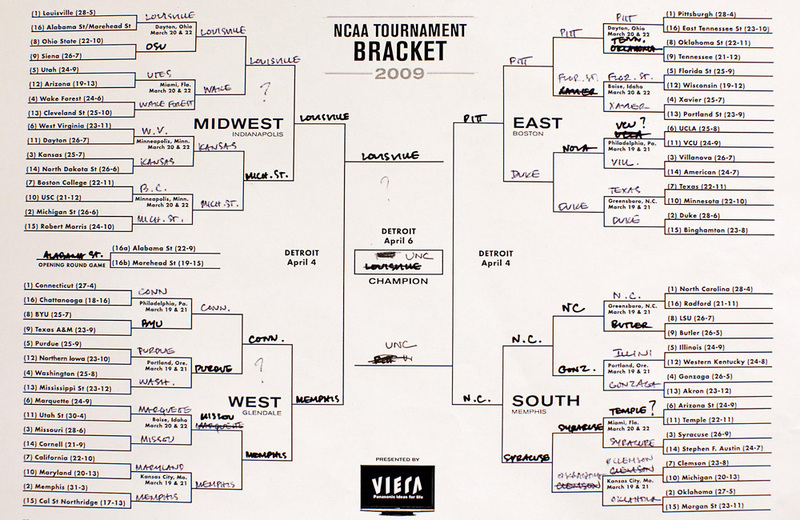 Discover what Barak’s handwriting says about him and get a glimpse into how he truly feels about some of his hand picked choices for the NCAA tournament. From the handwriting analyst’s point of view the first thing I notice is that Obama prints all of his answers, he does not use straight cursive writing. 3. They are erecting walls to keep their privacy intact, not revealing their emotions and keeping things under wrap. When a person prints, he feels more in control and control is important to that writer. To be fair, one must look at the circumstances around the writing at any given time. There is only a small area in which to write in this NCAA Tournament Bracket. So he made a choice to print because when contained to small cramped places, Obama opts to separate from his emotions, rely on his sharp quick reflexes and instincts and only reveal things about his person that he chooses to. He also likes to have a strong sense of control over the situation. Are we still talking about the NCAA picks? When very small handwriting is legible and easy to read, it reveals the writer has enormous powers to focus and concentrate, even when there is an enormous amount of material to filter through. Obama fluctuates in his writing; some of the words are straight printing while others are a mix of cursive and printing. When a person combines printing with cursive within the same word, it reveals the writer has good instincts and is in touch with their intuitive 6th sense about things. 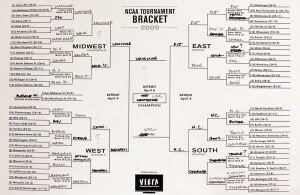 Look at how he writes the word “Louisville” for example. It flows very easily as he combines both cursive and printing. If one were speaking the way this word is written, it would roll easily right off the tongue. He has an easy feel for Louisville……..why? That we don’t know. Remember some things he is keeping hidden and under wraps! All of his printing in this particular and isolated sample is written with a slant that from the graphologist’s point of view reveals one who is using logic and practicality. No emotional or impulsive decisions. On the word Purdue, there is a change of slant within the word. Notice how the “e” in Purdue (in the lighter ink sample) slants backwards? When a letter suddenly juts backwards, it reveals that our writer is suddenly is going within himself, withdrawing to an even less emotionally revealing place and possibly acting more sure than he may really feel. He may be exuding a confidence about that pick that he may not really feel. Another hint for you the reader: The t crossings are written with a strong sure pressure, revealing much deliberation and determination. Obama is more optimistic about some picks, than others (deep down inside). If you were to put a ruler under the word, you would see that some of them slant upwards. That reveals the writer is feeling optimistic. It is an ancient science that has been around since the days of Aristotle. Approximately 80% of the corporations in Europe use it for employment screening. It is a science that offers incredible insight into who a person really is. Every single time that you and I put our pen to the paper, we are revealing much more about ourselves than mere words could ever convey. What we write comes from the conscious mind. How we write comes from the subconscious mind. So in essence, the writing truly is on the wall and yes, we can read between the lines.